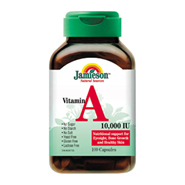 Vitamin A is an antioxidant essential for growth and development of cells, skin tissue, vision and proper immune function. We do not use synthetic methanol wood alcohol to prepare our natural Vitamin A, as do many supplement suppliers. We use only halibut fish liver oil. It is ultra purified and prepared in a soft get capsule to prevent oxidation. Each capsule contains: Vitamin A Retinol 10,000IU (derived from fresh, pure fish liver oil).